View More In Utensils & Holders. Good Grips Coated YouthspoonIdeal for persons with biting reflexes and limited coordination.All the features of Good Grips® cutlery with a Plastisol™ coating that protects teeth and lips. Ideal for clients with spasticity or limited hand control. Not recommended for those with heavy biting reflexes. Can be used with the Goodie™ -Strap. Hand washing in cold water will prolong product life. 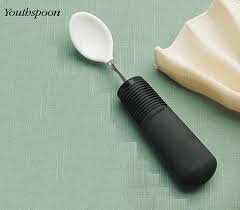 The Sample Kit includes one each of the three coated spoons. This is an hygiene product and cannot be returned. Product photo may not exactly match the product offered for sale. Please refer to the product description. If you have any questions about this product by North Coast Medical, contact us by completing and submitting the form below. If you are looking for a specif part number, please include it with your message.